Like the tobacco and asbestos industries before them, the nuclear lobby will ruthlessly promote any lie to keep their industry going. Of course it’s all about getting tax-payer money. How? By promoting the lie that nuclear energy is a solution to climate change, so should get financial incentives from government. 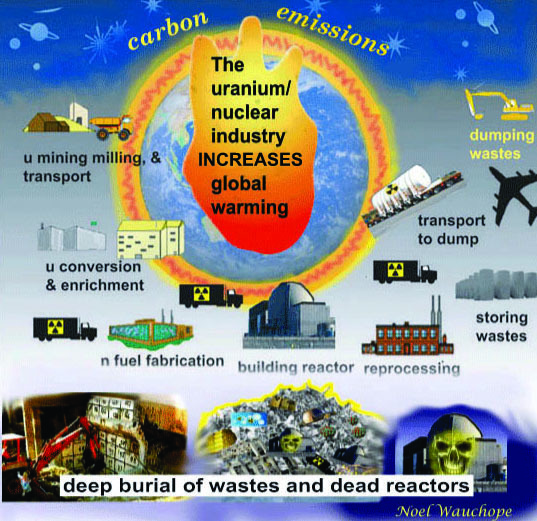 The entire nuclear fuel chain releases greenhouse gases. The nuclear fuel chain is in itself a grave danger because weather extremes with climate change could cause nuclear disasters. Even if nuclear power were clean and greenhouse gas free, (which it’s not) it would not be ready in time to have any real effect on climate. It would require the very quick build of some 2000 large reactors – or of millions of the much touted Small Modular Nuclear Reactors. On this, the hypocrisy of nuclear front groups is breath-taking. The Breakthrough Institute and UK’s Alvin Weinberg Foundation know perfectly well that their touted nuclear power is no solution to global warming. U.S. President Donald Trump, and North Korean dictator Kim Jong Un seem to have both achieved their goals at the much hyped ‘nuclear summit’ in Singapore on June 12. Kim achieved a kind of international recognition as an equal world leader, without having to give up anything, in the showy but fairly meaningless negotiation that went on . Trump achieved his over-riding aim – having the eyes of the world on him, his endless craving for attention being satisfied, for the moment, anyway. The body language is more interesting than the waffly document outcome. We saw Trump’s super-long super-strong handshake, and pats on Kim’s back – signs of dominance. We saw Kim’s eyes move sideways – a little nervous shiftiness? It all could have been worse. Trump could have chosen, instead of his effusive praise for Kim, to say there is “a special place in hell” for Kim, (as Trump recently said of USA’s ally, Canada’s Prime Minister Trudeau). And with Trump’s new and dangerously bellicose security adviser John Bolton, hovering about, could have set off the “fire and fury” that he previously promised North Korea. I guess that Trump saved that for a later occasion, when he feels that he is not getting enough world attention. The most interesting one, North Korea commits to work towards “complete denuclearisation of the Korean Peninsula.” Not a word about “complete, verifiable and irreversible”. As the Washington Post commented, that one is “empty blather” too. The fourth point is a weak statement on North Korea returning the remains of U.S. prisoners of war, from the Korean war. Why on earth would Kim Jong Un want to give up his biggest bargaining chip – the ability to send nuclear weapons to neighbouring States, and even to the USA? He saw what happened to Iraq and Libya. He can see how America is now backtracking from the nuclear agreement with Iran. The Bulletin of the Atomic Scientists estimate the “Doomsday Clock” at two minutes to midnight– meaning that the chances of a catastrophic nuclear war are very high: Major nuclear actors are on the cusp of a new arms race, one that will be very expensive and will increase the likelihood of accidents and misperceptions. Across the globe, nuclear weapons are poised to become more rather than less usable because of nations’ investments in their nuclear arsenals. For whatever reason – because national political leaders tend to be sociopaths, or because they’re beholden to the nuclear and weapons industries, and to the military – they are in the main, focused on distrust, hostility, and confrontation with each other. USA, formerly the most influential world power, is now stuck with an incompetent negotiator, and a dangerous narcissist, in Donald Trump. The North Korean dictator Kim Jong Un is consequently looking more reasonable, by comparison. Russia’s Vladimir Putin, and China’s Xi Jinping are watching as the Korean Peninsula crisis unfolds. South Korean leader Moon Jae-in continues to try desperately for a peaceful solution. Meanwhile, animosities continue between India’s President Modi and Pakistan’s President Mamnoon Hussain. Iran and Europe try to hang on to the Iran nuclear deal, the Joint Comprehensive Plan of Action. Middle East conflicts involve “proxy wars” between not only USA and Russia, but also Iran versus Saudi Arabia and Israel. Israel has nuclear weapons. Saudi Arabia, United Arab Emirates almost certainly aim to get nuclear. weapons. Of course, it’s a different story for the Trump and the USA, when it comes to letting the Saudi Arabians enrich uranium. Westinghouse is keen to sell U.S,. nuclear technology to Saudi Arabia, and the Trump administration is writhing about trying to bypass the “123 rule” which prohibits uranium enrichment. Saudi Arabia has been quick to militarily attack in the past – Bahrain 1994 and 2011 – Yemen recently. The regime’s brutality towards its own citizens should surely give the world pause to think about how it might behave towards other people, when it’s in possession of nuclear bombs. Cruelty and beheadings are “normal” for crimes -not only for murders, but also for apostasy, blasphemy, atheism. Of course, super salesman Donald Trump would find this irrelevant, indeed encouraging. After all, 12 months ago, Trump visited Riyadh , returning with a $350 Billion arms contract for America. Nuclear power for Saudi Arabia becomes an absurd idea, when you consider that Saudi Arabia is not only the “Saudi Arabia” of oil, but also of sunshine. Their motivation for nuclear weapons is clear. As Donald Trump considers sabotaging the Iran nuclear deal, the USA also considers making a nuclear sales deal with Saudi Arabia. They’ve got heaps of oil. They’ve got heaps of sunshine. Clearly Saudi Arabia has no need for expensive, dangerous, out-dated nuclear power. Crown Prince Mohammed bin Salman has admitted his readiness to develop nuclear weapons. 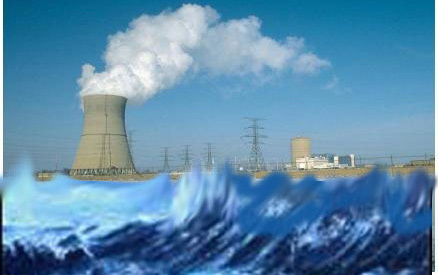 Well – “peaceful” nuclear power is that essential first step. Of course, Donald Trump would love to sell even more weaponry to Saudi Arabia. Heck, why not just waive that requirement, (the 123 agreement) that forbids them from uranium enriching and reprocessing? For the Trump administration, the need to sell USA nuclear technology would surely override any concern about weapons proliferation. The nuclear lobby is more of a religious cult than a science body. It relies a lot on the prevailing myth about “hard” science being somehow better than “soft science”. The nuclear doctrine is that if you’re not an expert in the “hard”sciences, then you cannot have a valid opinion. There were no biologists, geneticists, ecologists involved in the origin of nuclear weapons and nuclear power. It seems the same today, even though the most zealous nuclear lobbyists proclaim themselves as “environmentalists”. But their propaganda gives them away – shows their ignorance of those complex, nuanced sciences that are downgraded in the present global drive for unbridled technology development. One hardly dares mention studies like sociology, anthropology, ethnic studies … even economics – these are dismissed, too, as “soft” . But all these downgraded subjects are the ones we should be addressing, if the world is to be saved from the twin horrors of nuclear devastation and climate change. The nuclear industry was born in macho madness – and has stayed that way ever since. If women had equal say – had any say – things might have been different.